IMPHAL | Dec 10 : Chief minister, N. Biren said that the state government has taken up adequate security measures at all the border areas of the state to check entry of illegal migrants and thwart unlawful activities in the wake of Rohingya crisis in Myanmar and outsiders identification exercise in neighbouring Assam. Addressing media persons on Hill Leaders’ Day held at chief minister’s secretariat today, N. Biren said that a police station would be opened at Behiang at the earliest. The CM informed that he would personally visit the interior village located along Indo-Myanmar border in Churanchandpur district to lay the foundation stone of the police station soon after the finalisation of land for the said purpose. He also said that the state government is planning to deploy IRB personnel in the villages of Kwatha as well. Apart from opening an additional police post, around 60 armed police personnel had been sent to Jiribam to meet the required security manpower. Jiri police had been strengthened and directed to remain alert as illegal migrants trespass to state’s territory by crossing the temporary bamboo bridges built over Jiri river, he added. 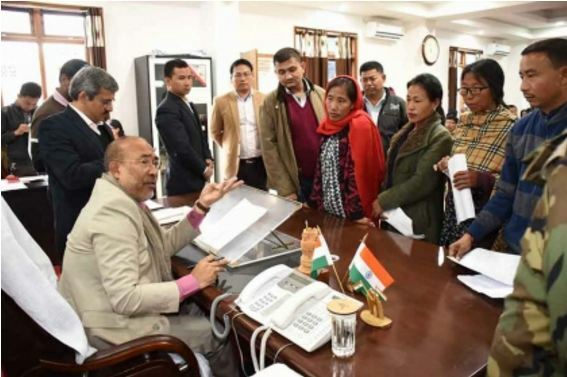 Biren further stated that the state government is ready to consider villagers’ proposal for construction of a ‘welcome gate’ and opening of a police check post at Jessami in Ukhrul district. He said that new chairman and members of Manipur Human Rights Commission would be appointed soon in order to strengthen the commission. Regarding the indefinite shutdown announced by the JAC of All Manipur DPC Completed Re-recruitment Candidates of Police Constables Male 2013, the CM appealed to the candidates to revoke their decision. He clarified that he had never assured to the JAC to declare the recruitment results within a stipulated deadline though he informed them that the Court had ordered the government to constitute an enquiry committee and submit a report within two months. He continued that he clearly told the JAC that the government could not do anything before the submission of the enquiry report as the matter is sub judice. The sudden announcement of indefinite shutdown by the JAC is very unfortunate and the government would not remain silent if the JAC goes ahead with the shutdown, he added. Responding to a query regarding the inconvenience faced by the people due to checking and frisking for long hours at Khudengthabi on NH-102, the CM said that all these problems would be eased out once a vehicle scanning machine is installed there. The machine had already been procured and it would be installed soon after finalisation of land, he added. Regarding implementation of ILPS, N. Biren said that a consultative committee comprising of representatives of all the communities of the state and a drafting committee would be constituted soon. He said that a notice to invite imminent persons to join the two committees would be issued on the media within a few days. The CM attended to 121 complaints and interacted with around 500 people during Hill Leaders’ Day from 9:30 am to 12:30 pm. Officials of different government departments were deputed at CM’s secretariat for the day to help attend to the grievances of the public. Directorate of Information and Public Relations (DIPR) screened documentaries highlighting the achievements of the new government.